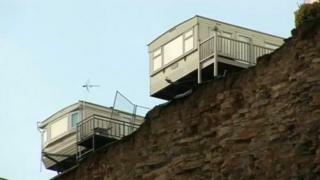 A meeting of experts on coastal erosion is being planned in the area where a dramatic rockfall left 15 caravans teetering on a cliff edge. The British Geological Survey has mapped dozens of similar landslides in Wales and warns more are "inevitable". The Vale of Glamorgan council is now organising a meeting of geological, engineering and government experts. Last week a cliff collapse at Porthkerry, near Barry, left caravans teetering on the edge of a drop. A huge section of cliff face suddenly gave way along a stretch estimated to be 10ft (3m) wide and 200 yards (180m) across. The underlying rock at Porthkerry is relatively soft sedimentary shale, and it has since emerged that a caravan owner first alerted the Vale of Glamorgan council about cracks close to the edge of the cliff on 4 October. A section of land at the top was then taped off, and consultants carried out a survey on 19 October. But the collapse happened 12 days later, before a further, more detailed inspection was due. The council said monitoring equipment belonging to the company Geotechnology Ltd was lost amongst the falling rock and debris. Miles Punter, the Vale council's head of visible services, is organising a seminar of experts to examine the risk. The authority's engineers and the Environment Agency are waiting for the details of a full geotechnical survey. Dr Helen Reeves, a senior engineering geologist with the British Geological Survey (BGS), said landslides can be hard to predict. The BGS manages a database with the records of over 180 landslides around Wales. "The biggest coastal landslide in the UK was at Holbeck Hall on the north Yorkshire coast near Scarborough in 1993," said Dr Reeves. "In that case, there were some signs before the main event. "The natural geology is the main element. The rate they can be eroded depends on whether the materials are soft or hard - whether they are broken up with a lot of fractures and are 'blocky' and even if they are against the prevailing wind," said Dr Reeves. "Obviously you get stronger erosion on the coast due to effects of waves, especially storm surges," she added. "It's a natural process and it's very difficult to stop but there are ways we can mitigate against it and there are certain engineering solutions that you can put in place. Some of them are very simple - and that's taking water away from the equation," explained Dr Reeves. "The more that water builds up, pressure builds up in the soils and rocks. They actually cause the material to fail. If you take the water away through drainage you can reduce the risk. You can also engineer solutions to steady the land by putting in piles so they don't get eroded any more". Dr Reeves said: "We could protect all of our coast but it would cost the UK government - and the governments in Wales and Scotland - huge amounts of money. No one has the resources to do that". A consultation on flooding and coastal erosion policy was launched by the Welsh government in July 2010. On Tuesday, Environment Minister John Griffiths said the Welsh government was working with the local council and Environment Agency after the collapse at Porthkerry. He told AMs: "The evidence suggests that in the future we may see more events like these, with higher sea levels, increases in the intensity of rainfall and more frequent flooding." The Welsh government's strategy will be launched next week in Borth, Ceredigion, and a major project to improve the coast defences in that area is under way. Experts have warned that the effects of global warning could increase the risk of flooding and speed up erosion of the Welsh coast. The Welsh government says it has spent £34m on coastal flood defences since the start of the 2010/11 financial year. An extra £14m has been earmarked for further work. The Environment Agency has spent £9.8m on shoreline defences with Welsh government funding in the same period. A Welsh government spokesperson said: "The national strategy for flood and coastal erosion is being launched on 14 November and will drive forward flood and coastal erosion risk management in Wales. "The strategy is part of the Welsh government's commitment to ensuring safer and more cohesive communities, a resilient environment and sustainable use of natural resources". The spokesperson said the publication of the strategy would not be the end, adding: "Regular reviews of the changing nature of flood and coastal erosion risk in Wales will be undertaken over its life, and the national strategy itself will be reviewed in 2016".